Print this coupon over at coupon.com so you can use it next week at CVS for free deodorant! 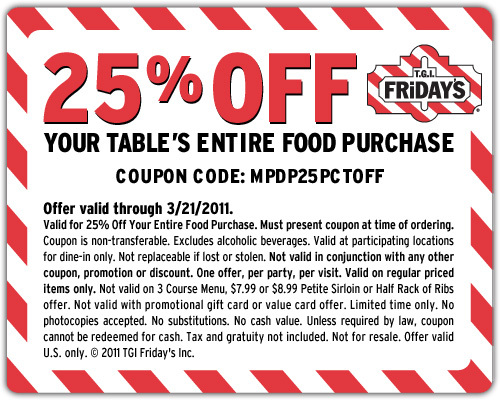 TGI Friday's is offering a new coupon AGAIN this week. 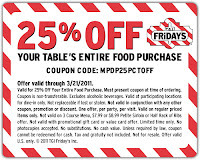 GO HERE to print a coupon good for 25% off your total food bill! Click HERE to find the printable coupon. Viewpoints is offering up $5 Amazon gift card for writing 5 reviews. You can download The American Frugal Housewife to your Kindle or Kindle Software. Don't forget you can also print certificates for places you plan to vacation in! Picaboo.com is offering a FREE Classic Custom Photo Book through March 22, 2011. Use code FREECC. Get a 20 Page Classic Leather or Classic Custom photo book for FREE! These books are valued at $39.99 and all you have to do is pay shipping of around $8! This is an incredible deal that doesn't come around often! Here's another FREE Kindle Download! Get Calm My Anxious Heart: A Woman's Guide to Finding Contentment FREE from Amazon! Head over to Facebook to sign up for a free Midnight Dazzler from Haagen-Dazs. You will receive a coupon via email. 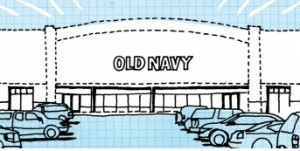 Old Navy has a $5/25 printable coupon available right now. If you are heading to JC Penney, print this coupon for a free Sephora Mascara at the Sephora Counter in JC Penney. Coupon is valid until 4/7/11 or while supplies last. CLICK HERE and go to the CVS Facebook page, “like” them and click on the “Special Offers” tab (lower left side) to get a printable coupon for a FREE candy or beverage! The coupon is valid through 3/13 and is sent via email. Must sign up before 3/10. I check NoMoreRack almost daily at noonish. I am usually not impressed, but today could bring you some good deals, especially if you have the $10 off $20 credit in your account. You can get that by signing up HERE. You may also have a $5 credit from Valentine's Day gift...did you check? Shop Taste of Home: FREE Measuring Cups + FREE Shipping on ANY order!! Taste of Home has an awesome promo going on where you get a FREE Set of Silicone Measuring cups + FREE Shipping on ANY order. They have Wrapping paper for ONLY $0.99 down from $4.99! The measuring cups are automatically added when you put something in your cart. Shop through ShopatHome to get 7% cash back and a $5 bonus if you are a new member. CLICK HERE to get a FREE Target Beauty Bag filled with FREE samples and $25 worth of savings! !